All guitar models start at $3900. Upgrades can be made to any guitar such as adding special inlay or using more exotic tone woods. Contact me for more information on guitars currently in stock, or to answer any questions regarding custom options. I work with all types of tone woods, with a preference for the unique and exotic species. 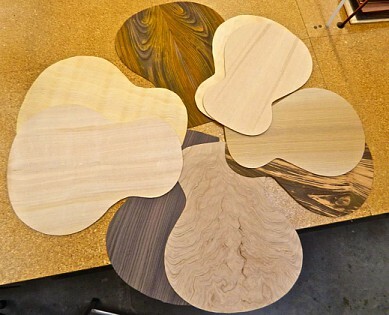 These days, a huge variety of tone woods are available through the internet and I usually leave it up to the customer to decide what he or she would prefer. Simply type in: "acoustic guitar tone woods" and do a little research. There are some tone woods, such as Sitka Spruce and East Indian Rosewood, that are readily available and thus, are reasonably priced. While others, such as Hawaiian Koa or Brazilian Rosewood, are scarce and/or are in high demand and therefore more costly. With that in mind; you only live once, so pick something you really like!